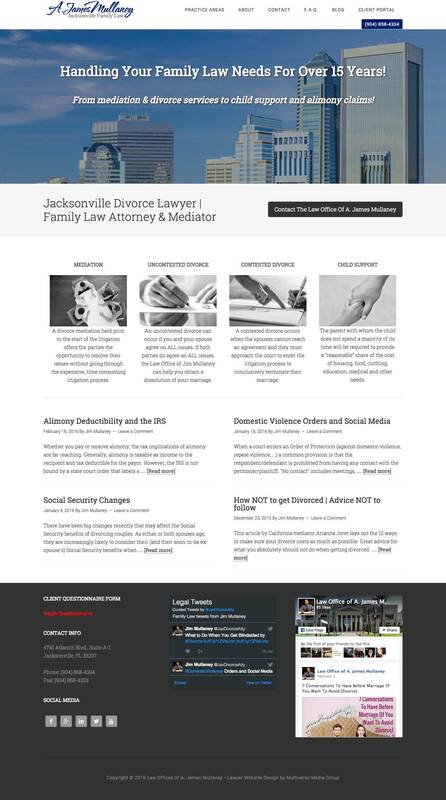 James Mullaney is an attorney in Jacksonville, Florida who specializes in divorce, mediation, child support, and alimony cases. His old website was not responsive and had an outdated blocky design, was hard to navigate and was using antiquated standards and SEO strategies which were penalizing his site in organic search rankings. His new website needed to shine and impress, while maintaining the same level of quality and professionalism as his competitors. It also needed to have a solid SEO foundation in place to help it show up on Google! Develop a minimalist website, with a modern look and feel. Developed the website on a high-quality, structured framework that is easy to grow and build upon. Created and implemented a fully customized & interactive form for his clients to fill out their information securely and easily through the website. Instructed the client on how to develop a quality content strategy to develop his online presence and instruct his audience on legal matters.